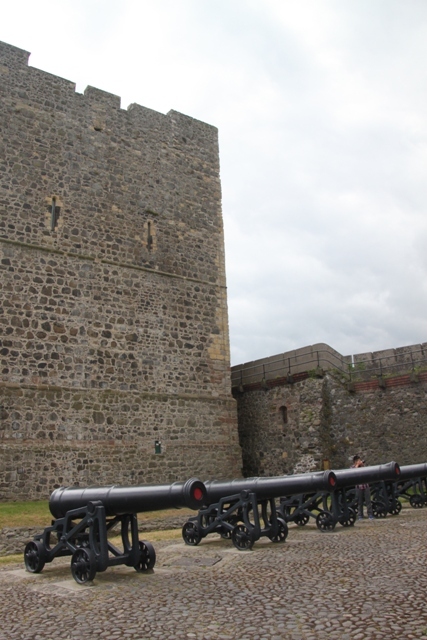 A striking feature of the landscape from land, sea and air Carrickfergus Castle represents over 800 years of military might. Having driven past it on numerous occasions and even spied it from the ferry as we sailed down out of Belfast Lough, this visit I determined we would finally discover what lay behind those imposing stone walls. We parked in a free car-park by the marina, ate a picnic lunch watching the boats bobbing in front of us framed with the magnificent back-drop of the castle. Interesting history to say the least – besieged by the Scots, Irish, English and French the castle was in use until 1928 and even became air-raid shelters in World War II. 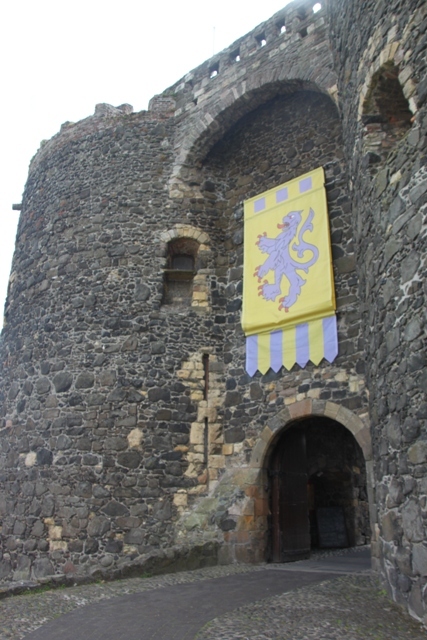 John de Courcy, the Anglo Norman baron who conquered much of Ulster started building the castle in 1178. 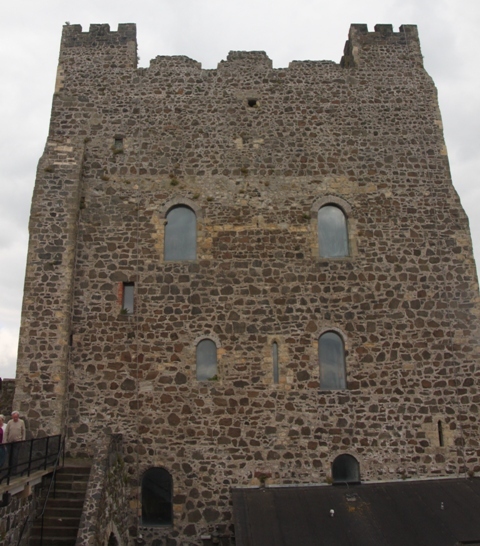 He did a great job, it is one of the best preserved Anglo Norman castles in Ireland and remains an iconic symbol of this town. 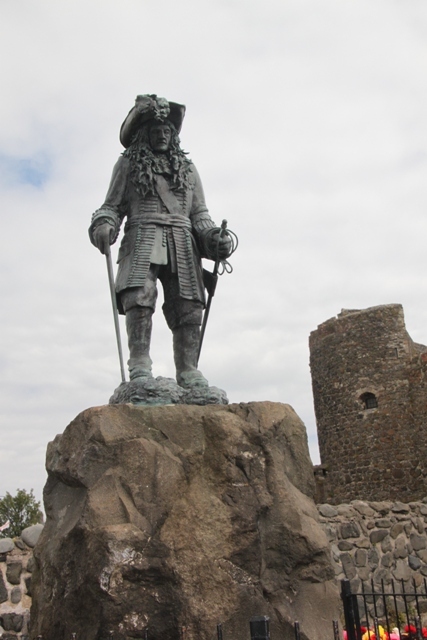 As well as all that King William III landed here before the Battle of the Boyne in 1690 – we found his statue just outside the castle entrance. Suitably impressed with the historical stuff we headed through the imposing gate, bought our tickets and found we had the place mainly to ourselves. It is all self-guided, information boards are dotted here and there but I would definitely recommend doing your homework before coming to get a proper feel for the place. 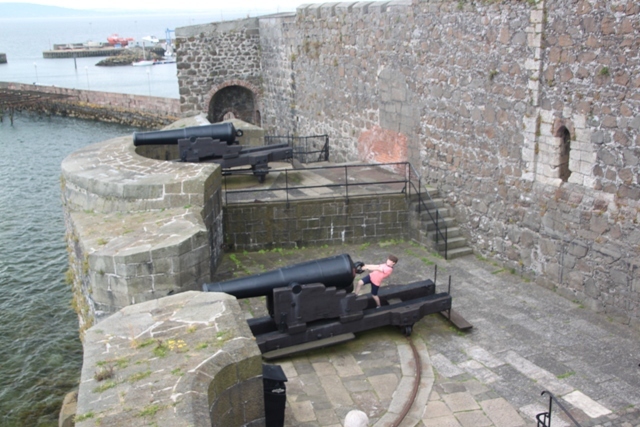 Son found stacks of steps to climb and cannons to clamber over – boy heaven for sure. We enjoyed the stunning views over Belfast Lough, although a cloudy day it still looked very pretty. 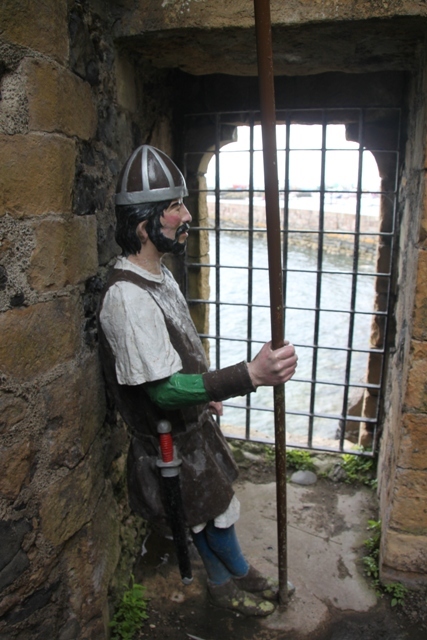 There are lots of life sized figures representing different historical characters associated with the castle and its history. 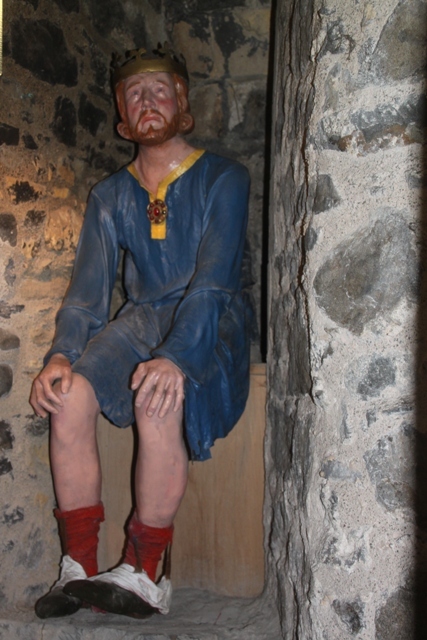 We found the Plantagenet villain King John perched on the medieval loo – Son’s favourite. 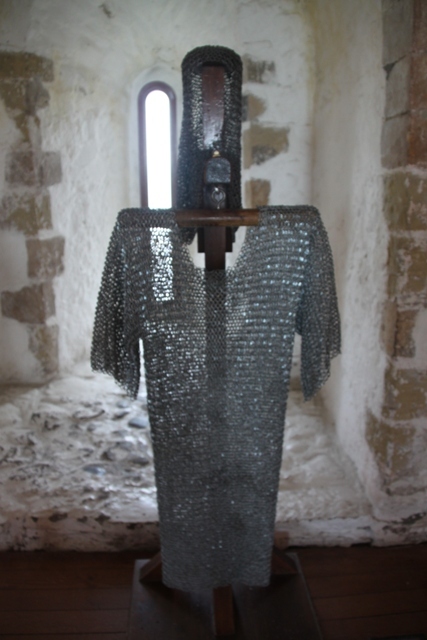 My pick though was Affreca Godfredsdottir – a Viking princess of Mann who married John de Courcy but missed her Isle of Man home and sits here looking nostalgically out to sea. 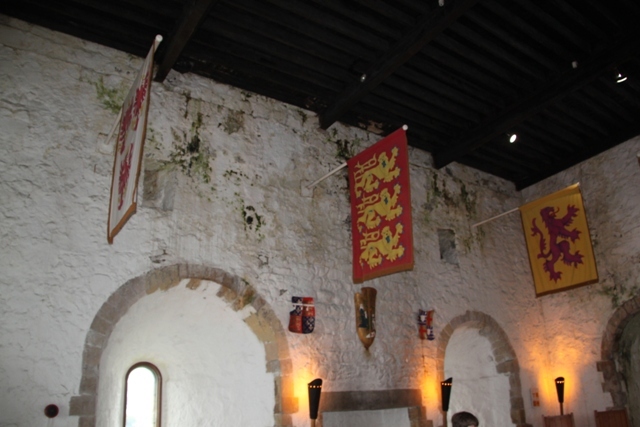 The medieval banqueting hall has been recreated, we had a look inside then watched a very child friendly cartoon type film about the history of the castle. 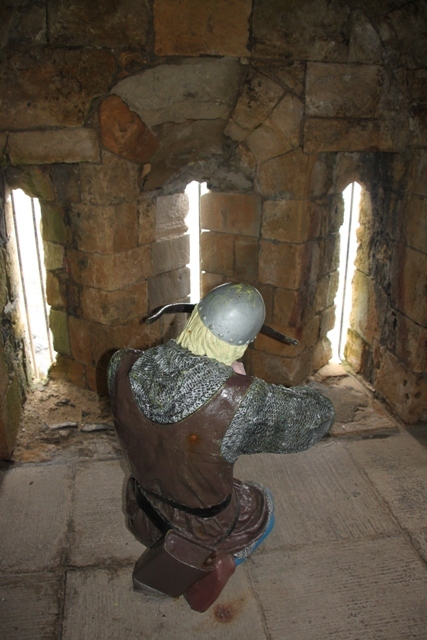 Up at the very top of the keep is a room full of medieval games, suits of armour and other gems. Needless to say we lingered there a while. Finally getting to look inside this magnificent castle we had a great morning. Mainly ruins I was glad we’d done our homework first. The history of this place is incredible, once you have a feel for that you really get an appreciation for those old stones. That looks to be the type of castle my kids would absolutely love. It looks to be an interesting castle, full of many layers of interesting history. The history behind it fascinated us, our son loved the chance to roam, climb and explore – something for everyone!! I love finding out what the history behind stone walls. It looks like a brilliant castle to explore particularly as you had the place to yourself almost! Those imposing figures thew me at first! I thought they were real men dressed up! With no-one else around it felt extra special for sure – the figures were a bit disconcerting to us as well at first. 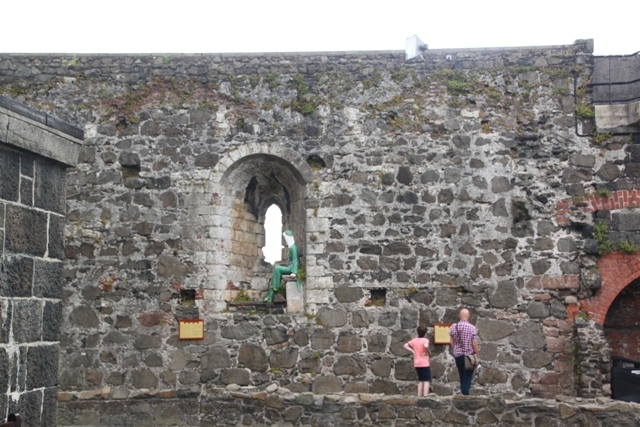 When we first arrived and saw “soldiers” peering through the battlements it felt a bit weird – we got used to them!! Thanks for coming along – it is a great place! 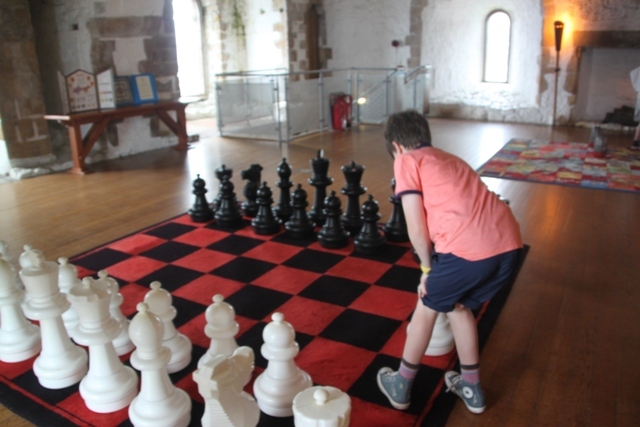 Thanks Suzanne – we really enjoyed exploring this castle, so much history but also lovely views of Belfast Lough from inside, something for everyone! 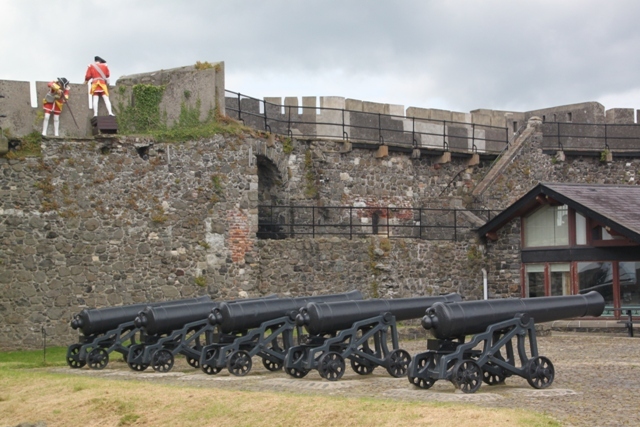 It is an intriguing castle – great stories from all through history, cannons and sea views – we loved it!! I love exploring old castles, the more ruined the better. I’ve not been to Northern Ireland at all. Yet another omission I should do something about! It’s only a short hop from here. Plenty of old ruins in N.Ireland to explore Anabel – this was a great one. So true about a short hop as well – you can see Scotland on a clear day just a little bit up the coast from this castle! We almost went once, years ago – it was one of the first breakthroughs in the peace process, then violence flared up again and we changed our minds. Really great post again! Thank you for sharing this trip! Thank you Erika!! Have a great day – hopefully filled with sunshine! You too, Joy! My daughter is currently spending time in England. She said the weather was gorgeous!!! Happy day to you! spellbinding area… thank you for sharing the pics! What a very interesting place filled with history. I love these kind of places. You can almost feel the history through the pictures. Thank you again. There was so much history in this place George – you could almost feel it oozing through the stones. The historical figures were a quirky touch too – appealing to the young (and not so young) in our family!! There is something in the ruins… honestly, what a great way to also teach kids about history, so hands on and loads of fun. Pretty fun to find those characters placed in the castle! We loved the figures – specially our son who found the history and stories instantly more compelling. We love ruins – running around and learning history at the same time, what could be better! What an impressive castle! It helps to know the history too, it makes the visit that much more interesting and makes being there a more meaningful experience! They had notice boards with some history sprinkled throughout but it definitely helped to read up beforehand. It is a fascinating castle, somewhere we’ve driven past so many times, can’t quite understand why it took us so long to go inside! I’m always drawn to old stones, and castles are so nice to visit, full of history ! This was such a cool castle – the history and stories were fascinating and as we had it all to ourselves imaginations could run wild! I can’t believe i was in Carrickfergus and didn’t go! If I ever go back to Northern Ireland, I’ll be sure to stop–you made it sound great! Oh that’s a shame – it’s mainly ruins inside but the history is fascinating and we just loved exploring. That really does look awesome! It’s fun to explore for kids but with plenty of history thrown in for good measure, definitely a great place to visit. Such a fun name! Why is Son in the stocks? I think it means Rock of Fergus – or something like that!! 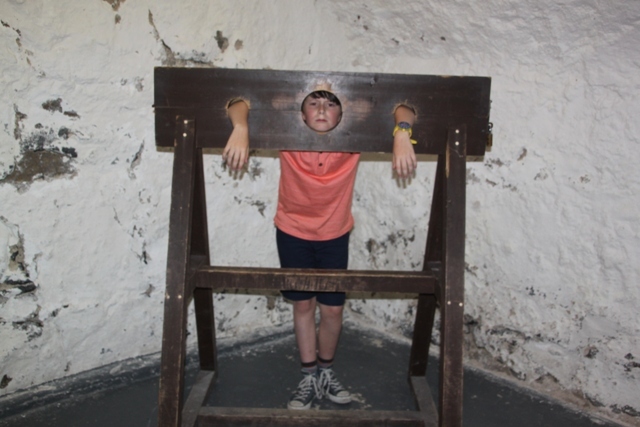 He has a slight obsession with trying out the stocks in different castles, he wasn’t naughty that day – well not much!! So what is it with toilets in museums and the like? there’s a Viking in the toilet in the Viking museum in York too (Yorvik?) . It’s really quite funny, as is King John here. This one I think was a bit of a villain, I guess they thought putting him on the toilet was his reward for bad behaviour!! Didn’t know about the Viking toilet at Yorvik though – we’ll definitely have to check that out out Ana!! It was a fascinating place – just glad we did our homework first Rosemary as the information was a bit spartan inside the castle. 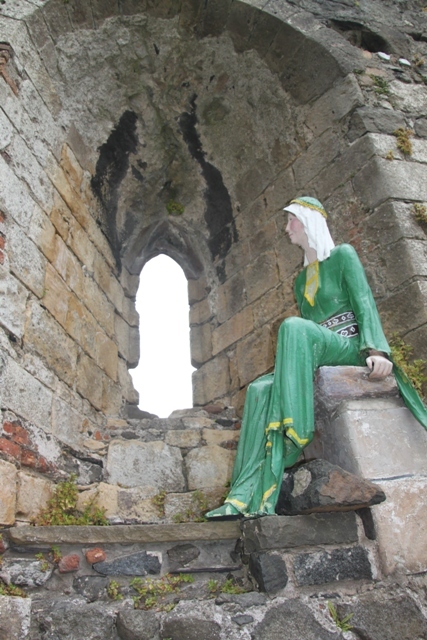 The figures were such a great idea too – I liked the wistful lady gazing out to sea!! Nice blog here. Seeing a historic castle is one in bucket list. Great post! I’m wondering what you suggest is the recommended visit time. I have a pretty packed itinerary for the day and plan to be here right at the open time of ten. Would a hour be too little to explore this castle? I plan to drive right up the coastal route to all the attractions up north afterwards. Hi Whit, I think an hour is just about right to see everything, we didn’t spend much more than that and really took our time. It’s basically just a shell but the history is interesting. Hope you enjoy the coastal route – one of my favourite drives!! Hi Whit, I think an hour is just right – we lingered and didn’t spend much longer. It’s really just a shell but some nooks and crannies to explore and great history. Hope you enjoy the coastal drive – we loved it!